Two ASIO officers should face prosecution for their role in the abduction of a Sydney medical student. If not why not? They're criminals and should face charges for their criminal acts. The charges against Izhar Ul-Haque were withdrawn last year, after a Supreme Court judge ruled that two ASIO officers had been "grossly improper" and criminal in their interviews with the student. The actions of the officers should be referred to prosecutors. But if they don't face prosecution it is because of the state sanctioned criminal government and the many criminal acts they should be charged with but to date have not. In Australia we live a lie. THE ASIO officer drew the figure "Y" in the gravel with his foot. "This is a Y; we are here," he said, gesturing to the intersection of the letter. "We've got two choices. We can go down the difficult path or the less difficult path." The officer was addressing a Sydney medical student, Izhar Ul Haque. It was dusk and the interrogation was about to begin at Francis Park, Bankstown. Mr Ul Haque was under no illusions that he was in serious trouble. For more than six months he had heard nothing. Now he was being told he was under investigation because an associate of his, Faheem Lodhi, [scapegoat in John Howards war on Iraq now doing 20 years for thought crime] was suspected of planning a terrorist attack in Sydney. "You're in a substantial amount of trouble," the ASIO officer told him. "We have many means of investigation and hold considerable information about you. What we now require from you is your full co-operation." With these threats began a series of events that terrified Mr Ul Haque and, in the end, led to the case against him yesterday collapsing. It is the latest in a series of high-profile blunders by those responsible for prosecuting the war against terrorism [Iraq and Afghanistan resource wars]. In a damning judgment, Justice Michael Adams said the two ASIO officers "committed the "criminal offences" of "false imprisonment" and "kidnapping" at common law". Their conduct was "grossly improper", he said. Ruling all subsequent police records of interview inadmissible, Justice Adams also observed that the officers' later explanations for their behaviour were defensive and, at times, untruthful. "They were aware that what they were doing was unlawful. They were perfectly aware that they were not entitled to detain. Nor was there any suggestion of emergency that might have provided some mitigation for their conduct," he said. 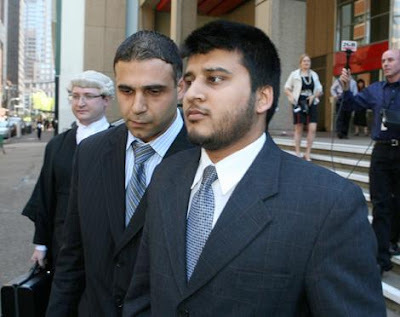 ASIO had obtained a warrant to search the premises of the Ul Haque family on November 6, 2003. But the warrant did not permit them to detain Mr Ul Haque or question him. But the ASIO officers did so at Francis Park and at the Ul Haque home while it was being raided by 30 plainclothes officers. For almost 10 hours, he was detained, threatened and interrogated, with an Australian Federal Police officer taking notes on the side. Mr Ul Haque said the meaning of doing things the difficult way or the less difficult way was clear. "I believed that I was under arrest and that if I did not comply with whatever they asked me that they will either use physical violence or take me to a more sinister place to interrogate me or, you know, do something to my family or deport me," he told the court. The initial ASIO raid and interrogations were followed up by interviews with the federal police. In the ensuing weeks, it became clear what the authorities really wanted: they needed him to become an informant. If he did not co-operate and spy on Lodhi he would face serious consequences. "You wouldn't want to miss third-year medicine," one of the police officers told him. Mr Ul Haque rebuffed the overtures, which included the suggestion that he wear a covert listening device. "It's dangerous for me to go and do this thing," he told the police. Four months or so after refusing to co-operate, Mr Ul Haque was arrested in April 2004 and charged with training with Lashkar-e-Taiba with the intention of causing harm to Indian armed forces. In his judgment, Justice Adams said any alleged offence "was of relatively minor criminality. Indeed, I think that he did not know he was committing an offence under Australian law." The Director of Public Prosecutions abandoned the trial and the Attorney-General, Philip Ruddock, said any disciplinary action against the ASIO officers was a matter for the intelligence watchdog, Ian Carnell. Quote: Each and every time the government are allowed to break the law and terrorise citizenry and then let off to get away with it is just another nail in the community coffin. Inspector-General Ian Carnell is no watchdog for intelligence. He’s grossly incompetent and should be sacked immediately. Then the government who instigated this state terrorism should be held to account. We can’t allow authorities in this country to carry out criminal acts and those responsible like the rest of the community who commit crime should be brought to justice. Ex-CIA Officials Tied to Rendition Program and Faulty Iraq Intel Tapped to Head Obama’s Intelligence Transition Team John Brennan and Jami Miscik, both former intelligence officials under George Tenet, are leading Barack Obama’s review of intelligence agencies and helping make recommendations to the new administration. Brennan has supported warrantless wiretapping and extraordinary rendition, and Miscik was involved with the politicized intelligence alleging weapons of mass destruction in the lead-up to the war on Iraq. We speak with former CIA analyst Melvin Goodman and Michael Ratner of the Center for Constitutional Rights. In a series of articles published last month, Melbourne's Age newspaper revealed that a covert police agent recently infiltrated several left-wing political and activist groups, including Socialist Alternative, Stop the War Coalition, Unity for Peace, and Animal Liberation Victoria. Beginning in 2006, the agent provocateur was involved in anti-Iraq war demonstrations—including last year's Asia-Pacific Economic Cooperation (APEC) protests in Sydney—animal liberation actions, and participated in planning meetings for a protest to be held against a weapons fair in South Australia. One other problem is that if the STATE decide to go all the way like for instance in the Hilton Bombing then they plant the bomb and blame the patsy. Federal police knew they had nothing to link Mohammed Haneef to terrorism, but pressed on regardless, writes David Marr. Lawyers for Melbourne man Jack Thomas are calling for an inquiry into the conduct of the Australian Federal Police and Commonwealth Director of Prosecutions, in pursuing him on terrorism charges. THE Haneef inquiry emerged briefly into daylight yesterday to hear the former chief justice Sir Gerard Brennan express concern that security laws are causing "too great an erosion of our fundamental rights". The inquiry into Australian authorities' handling of the Mohamed Haneef case needs stronger powers to avoid becoming a "toothless tiger", the former terror suspect's lawyer says. THE Australian Federal Police Commissioner, Mick Keelty, should stand down pending the outcome of the Clarke Inquiry into the handling of the Haneef case, the Australian Lawyers Alliance said yesterday. Greens...AFP needs to properly explain the reasons why it pursued the case against Dr Haneef. MORE than a year after a terrorism charge against him was dropped and more than $8 million later, the Australian Federal Police have finally confirmed they have cleared the Indian doctor Mohamed Haneef as a suspect. Lawyers for former Gold Coast-based Dr Mohamed Haneef say they have obtained new documents showing former immigration minister Kevin Andrews ignored advice from his own department. A lawyer representing former Gold Coast-based doctor Mohamed Haneef says a secret dossier used to cancel his client's visa contained no incriminating evidence against his client. Lawyers acting for Mohamed Haneef want an inquiry investigating the failed terrorism case against him to be given the powers of a royal commission. The retired judge who is investigating the case of Dr Mohamed Haneef says much of the evidence he has received will have to remain secret. Mohamed Haneef's lawyers say the Australian Federal Police (AFP) repeatedly denied their client's request for a lawyer to be present during his first interview. The head of the inquiry, retired Supreme Court judge John Clarke QC, says the forum will examine legislation as it applied to Dr Haneef. Australia’s largest and most protracted terrorist trial ended with distinctly mixed results last week in Melbourne. After a Victorian Supreme Court trial that ran for 115 days, the nine women and three men on the jury took nearly four weeks to reach their verdicts. While they found seven of the twelve defendants guilty of terrorist-related offences, they acquitted four others of all charges and were unable to reach a unanimous verdict on another, who now faces a lengthy re-trial.